So productive that I didn't even get a post done for the day. Did you notice? Pry not, but that's okay. 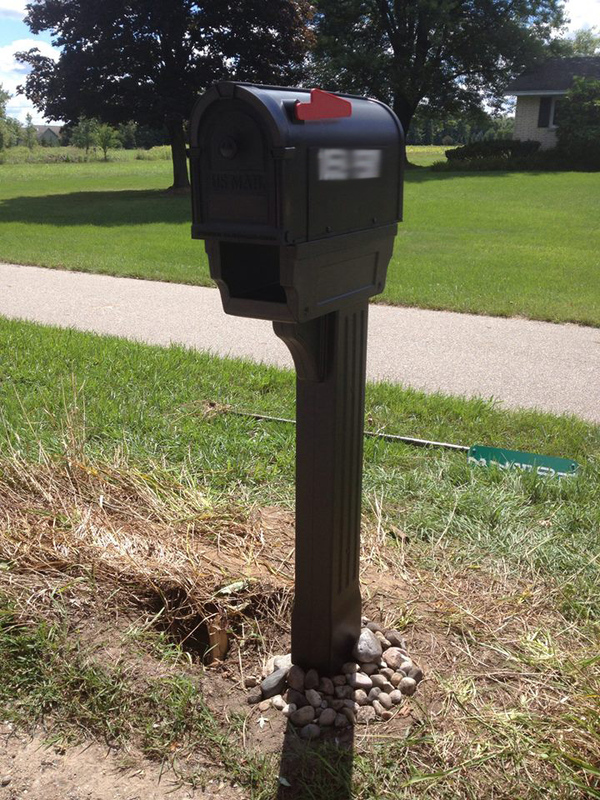 Before lunch I tackled the mailbox. If you didn't read Monday's post then you didn't hear our mailbox got mowed over by a vehicle while we were on vacation. We went to Menards and found a mailbox on sale for $39.99 with a $15 mail-in-rebate. They came in black or bronze. All they had out were bronze but I really wanted black. We almost just got bronze but a worker walked by and so I asked if there was anymore black. They checked and brought one out for me. Awesome. I got out my shovel and a level. We had to buy a 4x4 treated wood post. It was too long so I cut it with my miter saw. It said to bury the post 16 inches deep. I did 20 inches just to be safe. 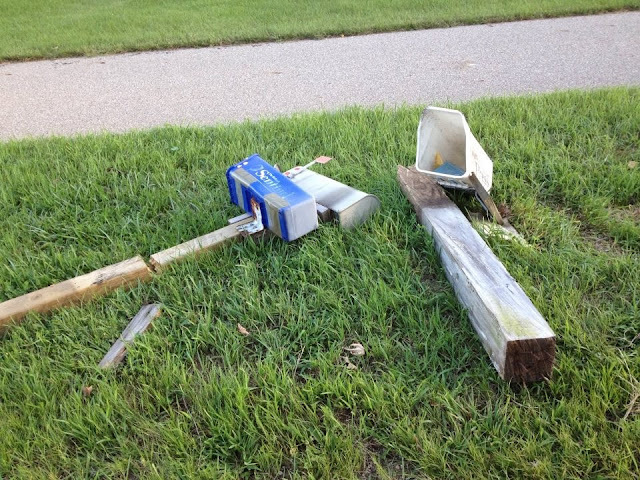 Then I put the mailbox casing over the wood post and screwed it together. I assembled the box following the directions and attached it to the top. I'm sure this isn't the last time we will have to deal with this. But hopefully it will last a while. I didn't stop there. After feeding the crew lunch I looked around my kitchen and decided to get some things done. Our kitchen is definitely an on-going process. I've had a utility sink for my kitchen sink for quite some time. It's nice because it holds lots of dirty dishes before I actually have to do them. But it sits lower and my back always ends up hurting after doing them. I had kept the sink that was previously installed before we started our kitchen makeover. Let's see a picture of how that looked. Then we took a lot of things apart and got rid of them and tried to make it look like a kitchen again. And this is how it was up until yesterday. I got the old sink from our garage and took it out in the grass to hose it off. It had accumulated quite a bit of dust and cobwebs. Plus it got pretty dirty when we started demo in the kitchen back in December. I had to unhook the plumbing from the utility sink. That is pretty easy. Hooking it back up to the new sink is the hard part. I also had to get out my little hand tool and cut the openings for the pipes in the bottom of the cabinet. I had to cut the bottom front of the cabinet to make an opening for the heat vent that comes out right by my toes when I'm doing dishes. Things always take longer than expected. I had hoped to have it all done before hubby came home from work but it didn't happen. He helped me a little with hooking the sink back up. The drain didn't come together quite right so I had to make a late night trip to Menards. After finishing it up around midnight, I was pretty pleased with myself. I finally had a real kitchen sink. There are gaps on either side of the cabinet so that it can be centered on the window. I'd like to find some gorgeous wood legs to put in there. In the meantime it will look a little funny. The sink is resting on scrap wood from our flooring until we can get counter tops. Ohhhhhh....counter tops. I dream about such luxuries all the time. Before counter tops, though, we need two more base cabinets. I want a small set of drawers next to my cook top. And a slightly wider set of drawers next to my dishwasher. And then we can get counter tops. I'm not sure what we are doing yet. But I'm thinking about DIYing something. Mostly because of our limited budget but also because I think I will like it best. We will see. Another thing I want to get done as soon as possible. Our oven. Or shall I say ovens. We have a double wall oven sitting in our garage. I am devising plans right now to make the cabinet that will hold the ovens. I think I can, I think I can, I think I can. They will go where our make shift pantry is. *Bummer. Our 'new' sink leaks. There is a hose that runs to the sprayer. The connection is cracked and leaks into the cabinet and on top of the sink deck. So much for recycling something old. Looks like I may have to get a new sink sooner than I thought. What have you tackled lately? Does cooler weather help you to be more productive? Fall is my project time and it has really felt like the beginning of fall lately.